Scarlet's Yarn Barn: Back again. I love the unique head on the nonyghan. It is so different and the fact that you made it differently just shows how talented you are. And those baby jackets are too sweet and the adornments are lovely. Beautiful little bedjackets. What pattern is that again? I know you've made them before and probably posted the pattern link. I am determined one day to make one of those! Time, time, where does it go. I love your bear! How cute! I echo Ghost. The head is so cute and very unique. He looks like he's just ready to give some sweet child a big hug. Did you write your instructions down? Beautiful as always, so nice to see you post again. I was getting worried about you. I'm sure the kids will love the bearghans, which I've still not made. My list of things to make..I can't tell you how long it is. Sweaters, beyond precious with the special little touches. I know there are about 3 versions of this sweater, I've used 2 I think, very close in directions but different in sizing I think from memory. Which one did you use? The sweaters all look nice. 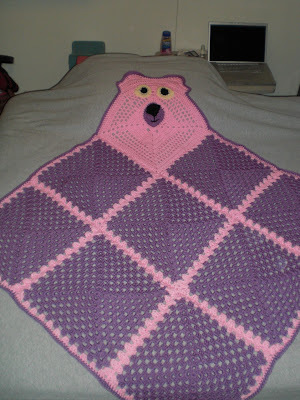 The bearghan is adorable, Lily is sure to love it.